If merely the Foreword of Albert Speer's 1969 memoir Inside the Thrid Reich is little but useless drivel, the book cannot be trusted. Here we will add some comments following the various paragraphs in Speer's Foreword to his book, as it was translated into English by Richard and Clara Winston and published by The MacMillan Company. 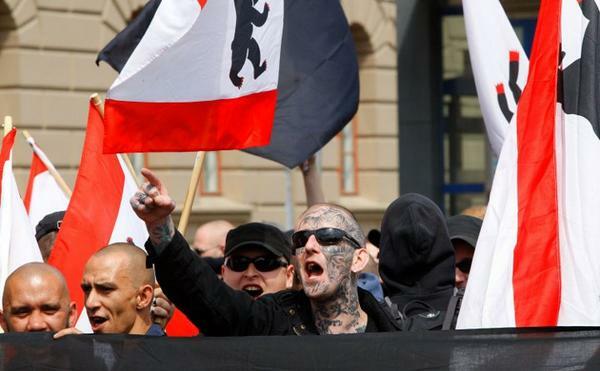 The Holocaust, the greatest lie ever invented, will never run out of innocent Jewish victims or evil Nazi perpetrators so long as there is one German - or even one White European - remaining in existence. The lying Jews have now obtained the latest victim of their 100-year scam. (Yes, the "Holocaust" actually began nearly 20 years before Hitler came to power.) We pity 89-year-old Johann "Hans" Breyer, whom the Jews have had in their sites for years, and who is now unjustly imprisoned in Pennsylvania. Notice that Fox News interviews negresses on the street professing that Breyer deserves this treatment, and as if their opinions could actually matter, as if they actually know anything at all. Also notice that the government spokeswoman knows a great deal about supposed holocaust "victims" who have never been shown to actually exist. 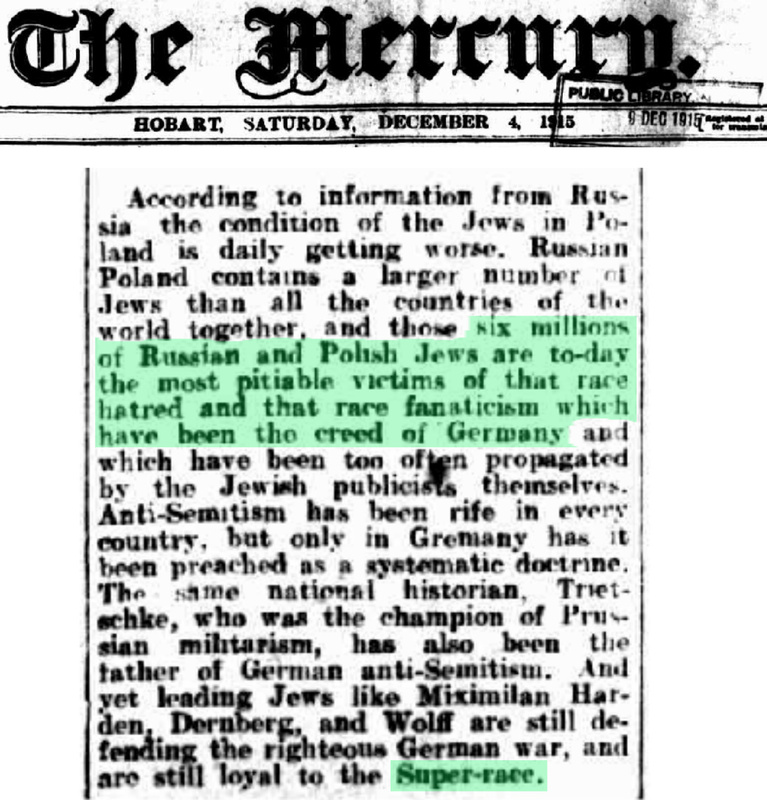 The "Super-Race" of anti-semitic Germans and their pitiable victims the Jews, in 1915? 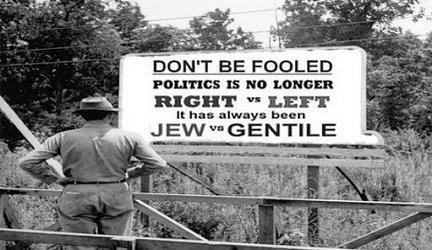 All of the lies and propaganda of the parasitical war-mongering Jews which was effective against Germans during and after the Second World War had already been tried in the First. "According to information from Russia, the condition of the Jews in Poland is daily getting worse. Russian Poland contains a larger number of Jews than all the countries of the world together, and those six millions of Russian and Polish Jews are today the most pitiable victims of that race hatred and that race fanaticism which have been the creed of Germany and which have been too often propagated by the Jewish publicists themselves. Anti-Semitism has been rife in every country, but only in Germany has it been preached as a systematic doctrine. The same national historian, Treitschke, who was the champion of Prussian militarism, has also been the father of German anti-Semitism. 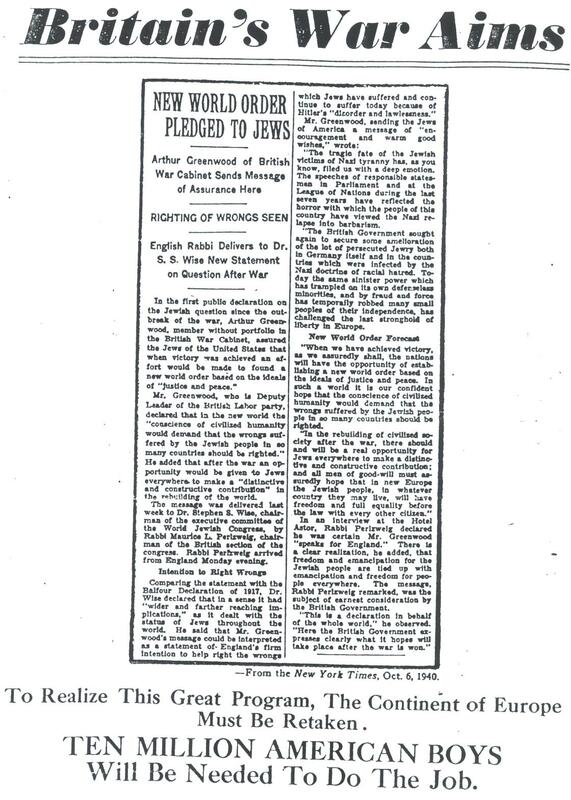 And yet leading Jews like Miximilan Harden, Dernberg, and Wolff are still defending the righteous German war, and are still loyal to the Super-race." 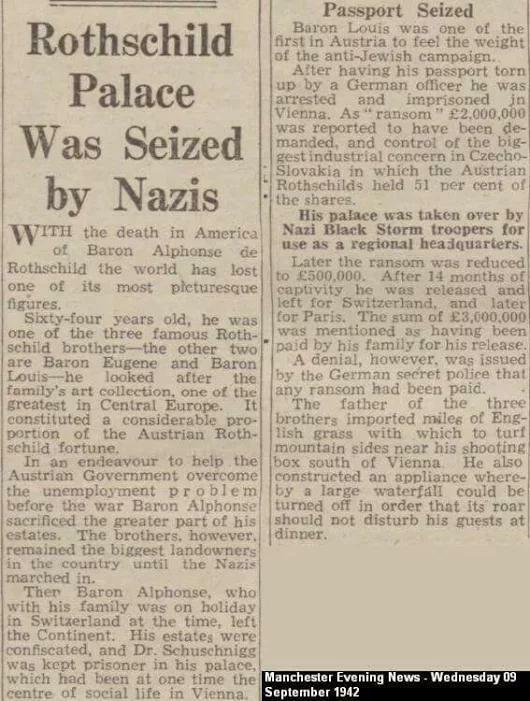 Courtesy of our friend Otto S.
Read more about The "Super-Race" of anti-semitic Germans and their pitiable victims the Jews, in 1915? "Sylvia Stolz [Posted on Pastebin.com] By: a guest on Jan 16th, 2013"
Banned Speech, banned evidence and banned legal defence. The reality of "Free Speech"
Our last speaker of the day will be lecturing on banned speech, banned evidence and even a ban on legal defence in court. On top of everything else, being banned from defending yourself in court constitutes a particularly disturbing problem. This speaker is a fully qualified lawyer and throughout her lecture I find it of particular importance, that we don't let our judgement be influenced by what our eyes and ears have already been shown or told. She really made the headlines a few years ago, as a defense attorney. So let me briefly explain with whom we are dealing with. This defense attorney has the courage of the lion. She is stronger than a man, and I have never met a woman with such a profile. 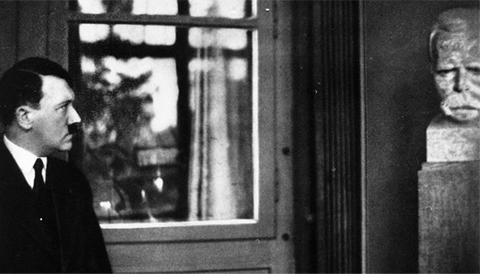 She bravely stood up and took it upon herself to defend Ernst Zündel in the famous case against him, for so-called 'holocaust denial' She was the trial lawyer of Ernst Zündel During the legal proceedings she provided evidence to the court, which could raise doubts regarding the official account of history. This caused furor in the courtroom. And she was prohibited from speaking any further. This speech-ban was ordered as she was presenting the arguments of the defendant. She was not allowed to argue the case, and barred from listing more evidence. She ignored the speech-ban and continued to submit evidence. And was then threatened on pain of penalties if she persisted. As it became too much for the authorities, she was arrested right there in the courtroom during her defence of the so-called 'holocaust denier' Ernst Zündel. But not even this could silence her, as she continued to speak the case of her defendant while being forcefully removed from the courtroom. For this she was imprisoned for almost three and a half years, in spite of her having no previous convictions. The four pictures below were provided by a friend who recently visited the Ukraine. Because the trip was not planned for tourism, some of the pictures are not the best quality since they were only taken with a cellphone, however they are clearly readable. Click on each of the images for a copy of the original. The first two images were taken in the St. Sophia Museum which is in the St Michael's Monestry Complex in central Kyiv (Kiev), where the history of the church there is recorded. The placard pictured describes the period during the Second World War, and relates how Christianity was actively restored during the occupation of German Axis forces. 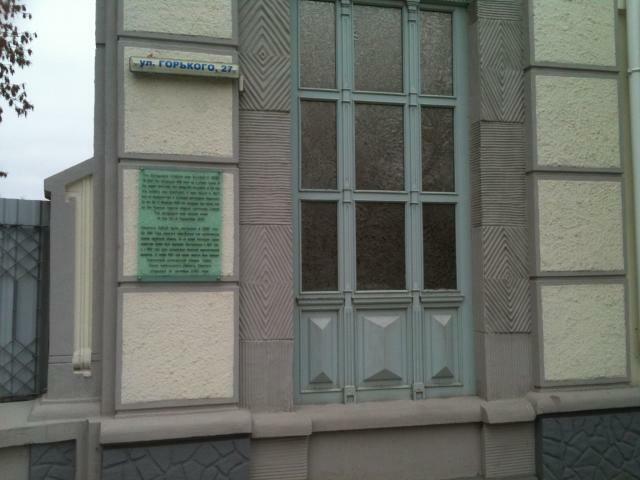 The second set of photos are of a plaque on the side of a synagogue in Kherson Ukraine which has been recently restored. On the plaque the Jews themselves describe how "prayer" continued there UNTIL the occupation by German Axis forces in 1941, upon which time such activity was stopped. So the Jews were able to keep their synogogues open during Soviet Communist rule, but the Christians were not, and the German Axis forces actively restored Christian worship and practices during their occupation of Kyiv (Kiev), while the Jews were forced to close their synagogue. These are clear facts which cannot be argued with. Considering the circumstances by which the Jews always claim that they suffered under Communism, and also claim that the National Socialists cared not for Christianity, it is easily demonstrable from available public proclamations that they are indeed found to be liars once again. 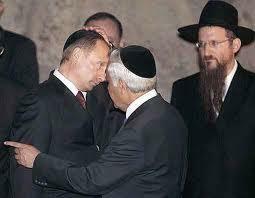 The pictures help to prove that the Soviets closed Christian churches, and left Jewish synagogues unmolested. Contrarily, the National Socialist Germans restored Christian churches to operation, and destroyed at least this one Jewish synagogue. We thank our friend for his astute recognition of the importance of the words on the placards, and for providing us with the images. 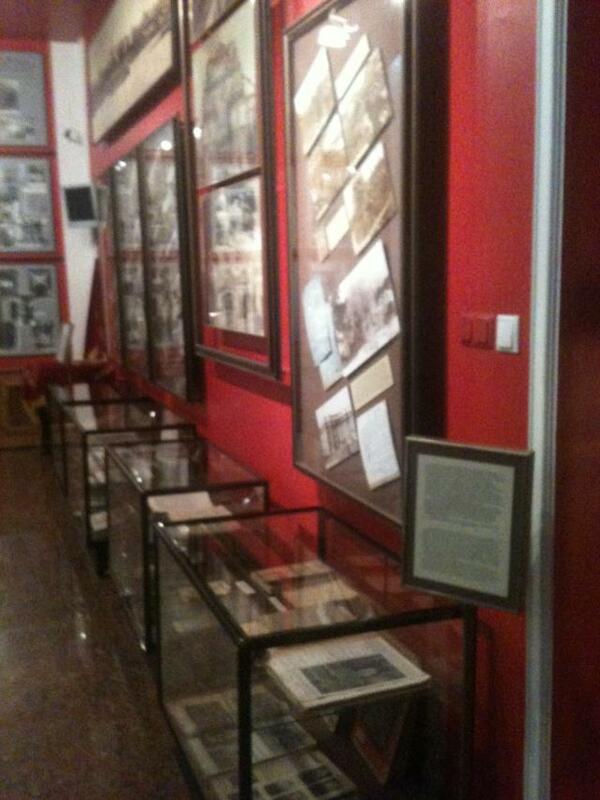 After the beginning of the Great Patriotic War, the stocks of St. Sophia Museum were not evacuated. On their basis, the occupational authorities opened the Architectural-Historic Museum and appointed Professor O. Povstenko its consultant. In 1942, some relics from St. Michael's Monastery appeared in the Local Museum of Ancient History and Prehistory (the Pedagogical Museum). Documents of the Einsatzstab of Reichsleiter A. Rosenberg recorded the transportation of one mosaic and 27 frescoes from St. Michael's Cathedral to Germany in October, 1943. In 1947-49, some (less than half) of the values, extensively damaged, returned to St. Sophia Museum. Relevant acts certify the receipt of five facial images (instead of eight removed), a hexagonal cross, an attributed ornament and four sets of fragments. 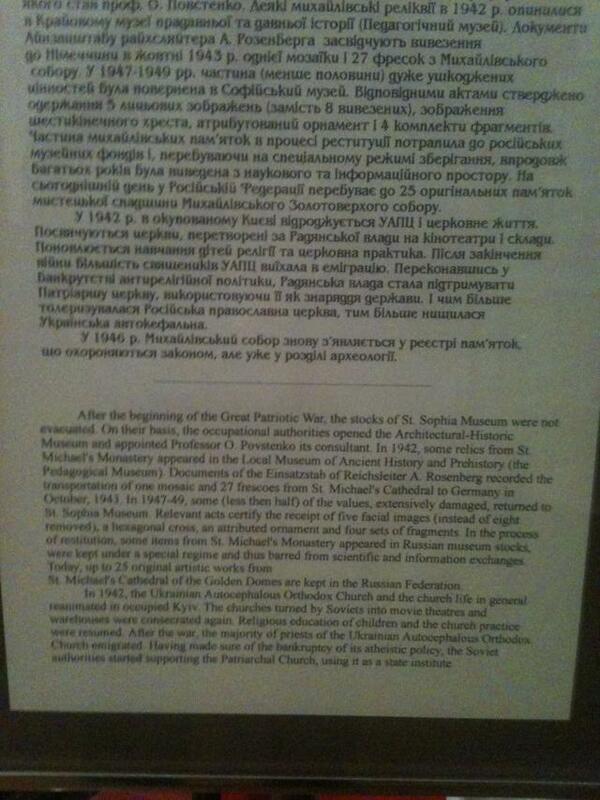 In the process of restitution, some items from St. Michael's Monastery appeared in Russian museum stocks, were kept under a special regime and thus barred from scientific and information exchanges. Today, up to 25 original artistic works from St. Michael's Cathedral of the Golden Domes are kept in the Russian Federation. In 1942, the Ukrainian Autocephalous Orthodox Church and the church life in general reanimated in occupied Kyiv. The churches turned by Soviets into movie theatres and warehouses were consecrated again. 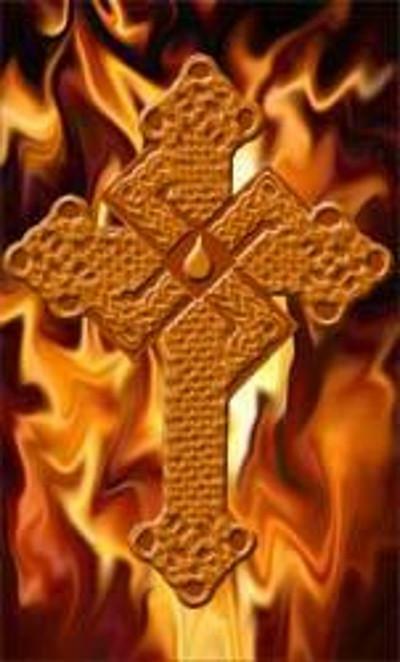 Religious education of children and the church practice were resumed. After the war, the majority of priests of the Ukrainian Autocephalous Orthodox Church emigrated. Having made sure of the bankruptcy of its atheistic policy, the Soviet authorities started supporting the Patriarchal Church, using it as a state institute. The Synagogue Chabad was founded in 1895. Till 1941 the synagogue was used as a prayer house of the Jewish community. But during the occupation of the city the building was destroyed. It was rebuilt in 1947 and re-equipped into a municipal narcological dispensary. 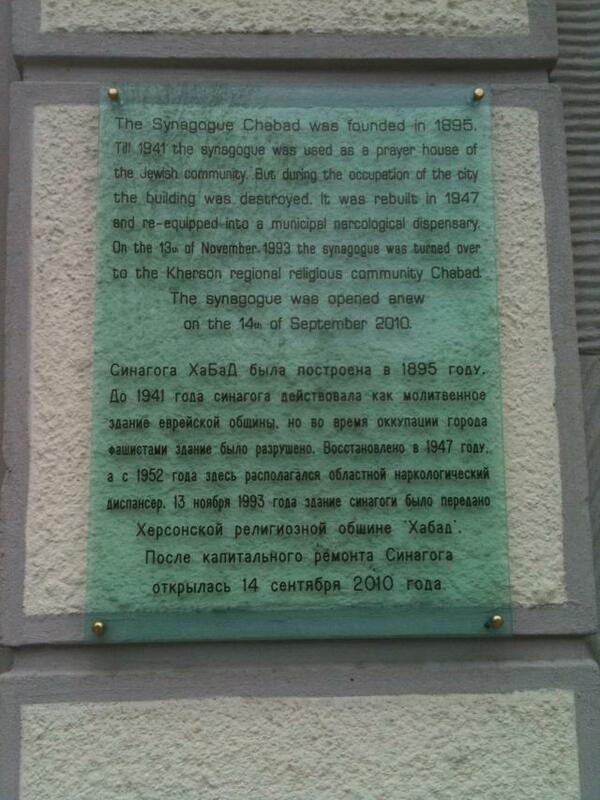 On the 13th of November 1993 the synagogue was turned over to the Kherson regional religious community Chabad. The Synagogue was opened anew on the 14th of September 2010. Dr. Wolffsohn Delivers Closlng Speech at Zioist Congress. THE HAGUE, Aug. 21. - The close today of the eighth international Zlonist Congress, which had been in sesslon in this city since Aug. 14, was marked with great enthusiasm. All the delegates un!ted in singing the "Psalm of Hope." Dr. David Wolffsohn of Cologne delivered the closing speech. He dwelt upon the success of the Congress, which, for the first tlme and in spite of divergence of opinion, had, he said, united in support of the idea of proceeding by political action to practical work for the dellverance of the poor Jewish people. Dr. Wolffsohn declared that the Jewlsh people must yet conquer the world.